This Workshop is held traditionally in Trieste every two years, since 1987. Following the tradition of the previous meetings, it will be devoted to recent advances in computational condensed matter physics and materials science, based on realistic calculations of the electronic structure of complex systems. 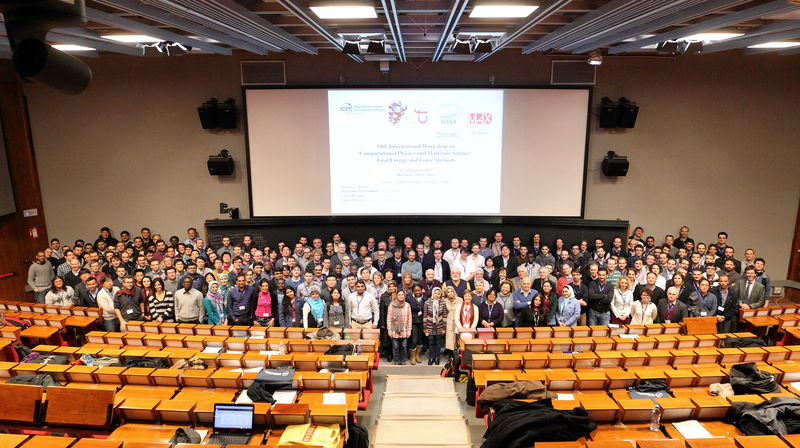 The activity will be held at the International Centre for Theoretical Physics (ICTP), Trieste, Italy from 12 to 14 January 2017 with the co-sponsorship of Psi-k, SISSA, Consortium for Physics of Trieste, MaX EU Centre of Excellence for HPC applications, the European Cooperation in Science and Technology (COST) and the EUSpec Action "Modern Tools for Spectroscopy on Advanced Materials". As in previous events of this series, the Workshop will consist of invited talks and contributed poster sessions, with ample space devoted to discussion. A special session will be held in memory of Walter Kohn, admired mentor and role model for many students and colleagues, who was awarded the Nobel Prize in Chemistry for his development of the density functional theory. The session will include the Award ceremony for the “Walter Kohn prize for quantum mechanical material modeling” (https://www.ictp.it/about-ictp/prizes-awards/walter-kohn-prize.aspx), co-funded by ICTP.